About HOBO Data Loggers "New Zealand"
Heating, ventilation, and air conditioning/refrigeration (HVAC/R) systems regulate thermal comfort inside of buildings and maintain adequate air quality by circulating and replenishing interior air with fresh outdoor air. Building operators and mechanical contractors who oversee these systems strive to ensure that HVAC/R equipment is running efficiently so that a proper interior environment is sustained and operating costs held at reasonable levels. To achieve better performance from HVAC/R systems, interior monitoring can provide valuable feedback in terms of system operations, leading to insights for correcting inefficiencies and optimizing equipment. Monitoring can also identify opportunities for energy efficiency upgrades and provide validation for improvements that contribute towards certification. Onset HOBO data loggers enable accurate monitoring of interior conditions, helping building professionals diagnose mechanical issues, locate sources that compromise comfort, and better balance healthy and comfortable interior environments with energy costs. 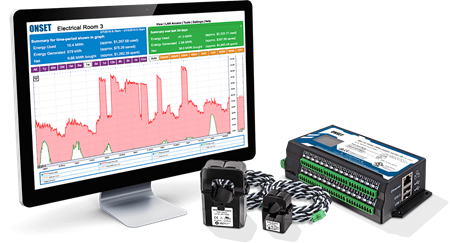 Onset EG4100 Series power monitoring systems combine revenue-grade power metering hardware, a full suite of current transformers, and cloud-based energy visualization software to help you manage your building’s energy use. Onset’s HOBO MX1101 data logger measures and transmits temperature and relative humidity data wirelessly to mobile devices via Bluetooth Smart technology. The HOBO Motor On/Off data logger records motor on and off conditions within an AC magnetic field with its internal sensor, or mechanical contact closures from external sensing devices. This logger is ideal for tracking the usage & runtimes of motors, pumps, compressors, and other equipment. Copyright © 2019 OneTemp New Zealand. All rights reserved.